So, I’m probably not supposed to publicize good news that hasn’t actually happened yet, but darn it, this is my blog and I will share what excites me! Although I will save all specifics, names, dates, links, etc until they have actually happened. Come on now, I wasn’t born yesterday. Last week I was contacted by a photographer offering to do a cookie themed photoshoot, to which I did an excited dance in my apartment and then graciously accepted. I had some ideas which (those of you that know me will undoubtedly agree) capture the chaos of life (me) while presenting a cool, calm and collected exterior (what I hope I pass as. on a good day.). I decided to incorporate my love of vintage and antiques and give it a Mad Men-esque vibe. I met with the photographer this morning to talk details and he loved the idea too, so we’re just looking to get a date on the calendar. Pictures coming soon! Then as I was walking home tonight, I got an email that was a forward from my mother. She had shared my project with a well known NY radio station that loved the idea and now wants to do a phone interview with me sometime this week! Also the station name, channels and time to follow. Oh, also, you guys know that Pachanga Patterson is my drop spot for this week and here’s the best part – they know I’m coming, they already know about the project, what it is and are excited for it! Single Girl Cookies’ reputation has preceded her in the best way possible. Could it be true that my days of being met with skepticism are coming to an end? 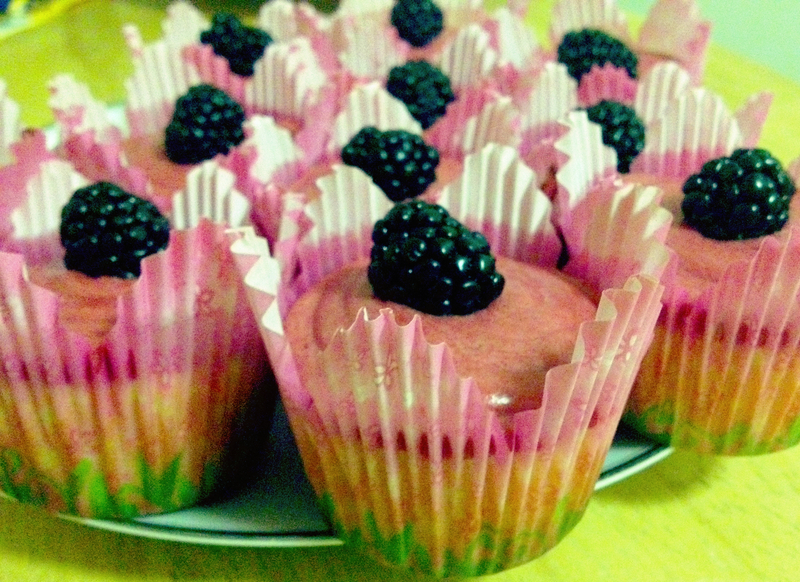 I shall leave you now with this picture of my Lemon Blackberry Cupcakes.